I am an independent entrepreneur. 'Mysticism' is "the pursuit of communion with, identity with, or conscious awareness of an ultimate reality, divinity, spiritual truth, or God, through direct experience, intuition or insight." The International Conference "Mysticism without Bounds" makes an attempt to explore the "mystical consciousness" from different disciplines, like religions (Hinduism, Judaism, Christianity, Islam, Buddhism, Taoism, etc), sciences (biology, new physics, neuroscience, and logic), humanities (philosophy, theology, spirituality, psychology, etc. ), and art forms (poetry, music, dance, visual arts and rituals). Researches reveal that certain common grounds do exist among the various forms of consciousness, scattered among the world's religions, theologies, sciences, philosophies and art forms. The discovery of such points of convergence holds out the possibility of creating a 'new worldview', and this new world view can create an awareness of the essential 'unity' of humanity. 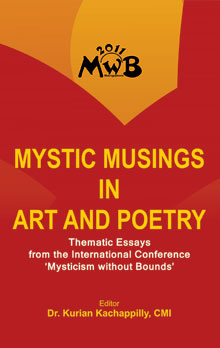 Let these scholarly papers, presented from different domains of art and poetry, help the inquisitive readers to discover this essential unity, which is often conceived and interpreted in terms of ‘God-experience’ with its basis within non-phenomenal self, and a unity that promises the unity of all experiences within the phenomenal world.